About a year and a half ago, I got a chance to travel with Rusty while he attended a conference for his job. Destination? Clearwater Beach in sunny Florida. It was fantastic! Even though it was early December and too cool to swim, the sun and surf were gorgeous. I spent 4 days reading, taking really long walks along the beach, and napping; capping off my days with dinner that I did not cook with my husband every night! On my trips out to the beach, I looked for shells to bring home to my kids. I must have picked up hundreds of shells, rinsing them in sea water, turning them over and over in my hands, inspecting them, then throwing all but a very few back to the gulf. I was drawn, over and over, to shells that looked to be perfect, but upon further inspection were flawed. They would be cracked, broken or missing a chunk out of them. I would rinse and caress them, thinking that maybe they were good enough to keep, then eventually give them up and toss them back into the waves. I only wanted perfect ones, and no matter how long I stared at them, they would not be right. Sometimes, though, I would linger too long, reluctant to move on, thinking what a shame this shell is flawed- if only it were different. In the end, it was worth the wait. I found two big strong colorful ones for Caleb, my big strong boy. I found a pink one shaped kind of like a heart and an orange and white cat’s paw for Emily, my big-hearted girl. And I found two purple coquinas which opened into beautiful butterflies for my baby Katie. I am so glad that I waited for those perfect ones, and that my kids still have them. God is that way. He has so many beautiful and perfect gifts waiting for us. So often though, because we are in such a hurry, we rush to get what we can, settling because we are afraid of missing something, losing something. Then we clutch some things to us tightly, unwilling to give them up for something better. We gravitate towards what looks ‘good enough’ instead of waiting for God’s best. We settle for a broken, less than perfect shell. We take these things that look good on the surface, but in reality are flawed, have cracks, or are missing parts and we turn them over and over in our hands willing them to be better, wishing for them to be right. But they aren’t. Sometimes it is an unhealthy habit that makes us feel good only fleetingly. Sometimes it is a job that we keep only because we fear there is nothing better. It could be a relationship where we linger long after it is good for us. Sometimes it is a dream we feel repeatedly drawn towards that is our own will and not truly God’s. It could be an unresolved past hurt that still haunts us. 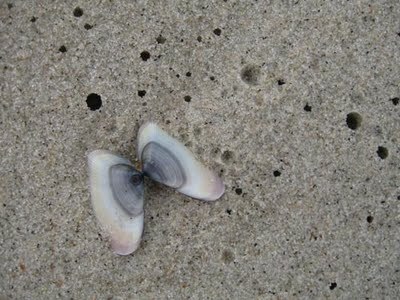 For me that day on the beach, I saw the imperfect shell metaphor in a broken relationship that I wanted so badly to be different, but felt powerless to fix. I did not want to accept the way it was, so I kept doggedly turning it over and over in my mind, seeking a solution. But there was not a solution. It was broken. Like so many shells on the beach, it would never be what I wanted it to be. And my attachment to it was becoming the larger problem. Because I was spending so much time going over it and over it in my head, it was taking my attention away from the good, healthy, whole things in my life. It kept me distracted from God’s best for me. I would never be able to find those perfect shells if I kept mourning the broken ones. I would never see the blessings in front of my face if I kept focusing on the losses. But I couldn’t seem to let it go. Like the proverb says: As a dog returns to his vomit, so a fool returns to his folly. We can become fixated on some ‘thing’- relationship, job, circumstance, memory from the past- that we desperately wish was better than it was, refusing to believe that maybe it can’t be. The answer is to do what I did with the imperfect shells. Trust that there is a better treasure ahead, and give the broken thing a mighty heave back to the sea. Cast it back out where it came from, fill the void it leaves with trust that God has a better plan. Then continue to stroll down the beach. Feel the wind, hear the surf, and while you keep your eyes trained for something finer, enjoy the walk. Don’t want to miss a post from nicolewhitespeaks? Look for the “Follow Blog via Email” below. Beautiful. And when broken things are given back to the sea, and they are no longer yours, the mighty sea is what continues to transform them. That is what God does for them. I was thinking of broken glass that is transformed into something smooth and beautiful in the sea. That’s true, Wendy! I thought about that, too. What holds us back from flinging those things back to the sea is a lack of trust that God can take better care of it than we can. I love the image of broken glass. Also, thanks for the share!